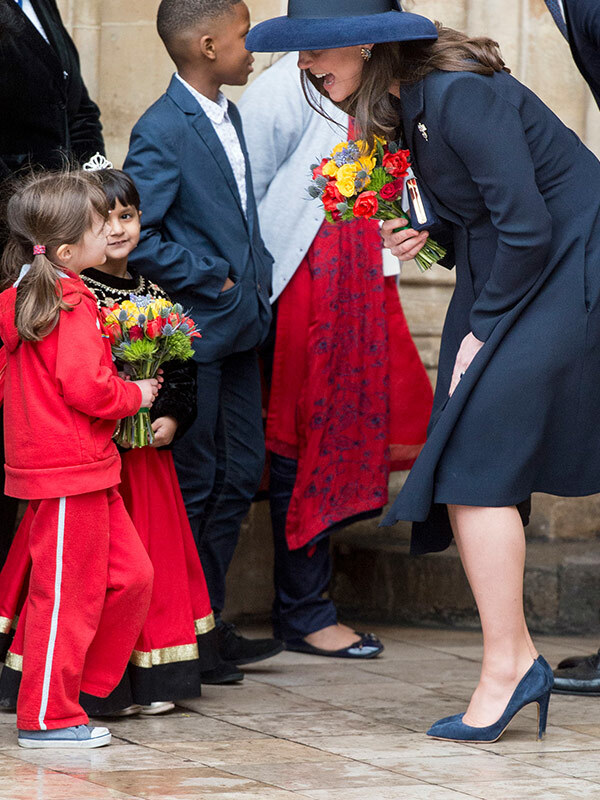 Many avid royal watchers thought Kate and Meghan wore identical navy pumps, but after some sleuthing it turns out the LA native donned a pair of Manolo Blahniks, while the pregnant mum rocked her trusty old favourites - the Celeste heels by Jimmy Choo. Kate, who is expecting her third little prince or princess in just a matter of weeks, let her future sister-in-law shine during the proceedings as she took to the altar to sing the national anthem. Putting their best foot forward in very very shoes. The royal-to-be was also spotted nodding along to musical performances, including an upbeat number from former One Direction band member Liam Payne. Her future husband was less enthusiastic by Liam's rendition of John Mayer's Waiting On the World to Change. Harry was spotted raising his eyebrows, which left his partner in a fit of giggles. Watch the adorable moment in the video player above! The Queen was radiant in burgundy! Following the event, the young royals spent some time with those who gathered from far and wide to catch a glimpse of their outing. The 36-year-old is stepping into the role of the people's princess with ease. Talking to David Swindells, she told him, "The service was beautiful, especially the choir and the music." Charmed by their conversation, the teacher admitted, "She was very personable. I think she'll be a great addition." Harry was besotted by how cute the young guests were. She's got the royal handshake down pat! Harry's future wife also eagerly chatted to pupils from the local school. 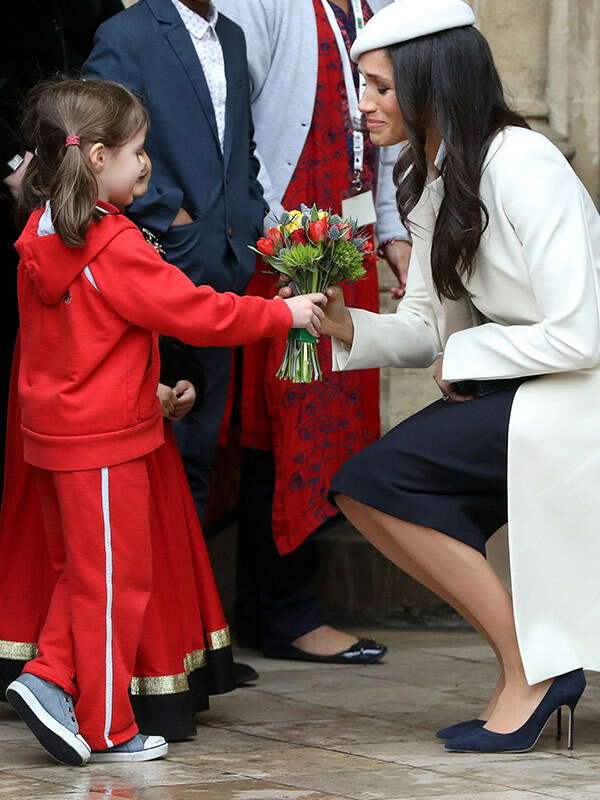 She was overheard telling them, "Hi, I'm Meghan," before gushing, "So sweet!" One attendee, Ms Hartley, shared a snippet of their moment together. "She was saying what a lovely service it had been and her first service at Westminster Abbey. We congratulated her on her engagement." "She was delighted and said she was 'very, very excited' about her wedding." Ms Hartley added, "She stayed chatting with us for quite a while - what a lovely, lovely lady." Before Meghan's big day - take a look at the tiaras she could wear for her royal nuptials! Her Majesty looks most pleased with her floral arrangement. This is Meghan's first time at Westminster Abbey. The British Royal Family then attended a private reception for those involved in the event. Meghan's attendance at the annual celebration is unprecedented given that she hasn't yet joined the royal family -- officially, that is. Her wedding to Prince Harry will take play on May 19 in St. George's Chapel at Windsor Castle.